Nuclear receptors are a class of transcription factors modulated by ligands. Two of the important regions of nuclear receptors are: 1) a ligand binding domain, which interacts with hormones or other molecules, and 2) a DNA binding domain, which targets the receptor to specific DNA sequences. 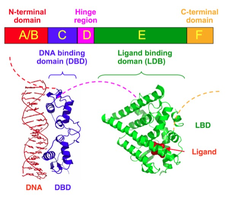 Ligand binding triggers a conformational change in the receptor and results in activation or repression of target gene expression. Nuclear receptors play a key role in development and homeostasis, and the receptors and their downstream genes are associated with numerous disease pathways. In collaboration with research labs from around the globe, Addgene has assembled a Nuclear Receptor plasmid collection for the community. If you have created plasmids that you would like to add to this collection, email [email protected] to be paired with an Addgene scientist.